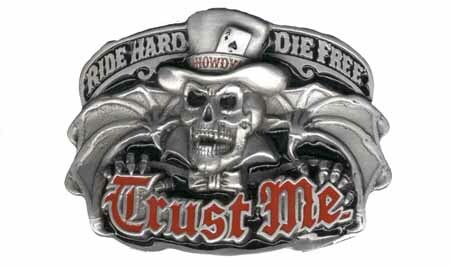 Belt Buckles by the Thousands! Ride Hard, Live Free! 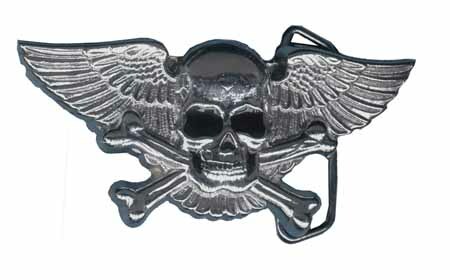 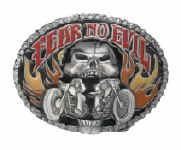 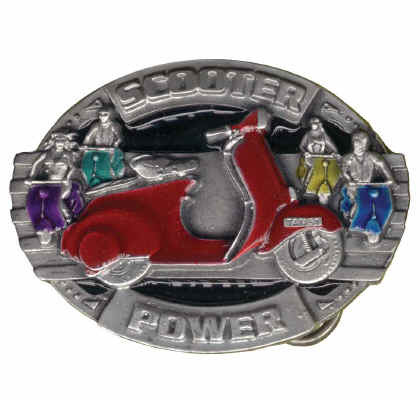 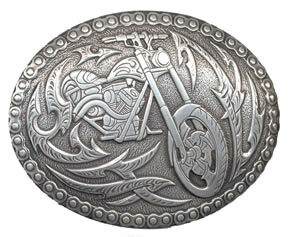 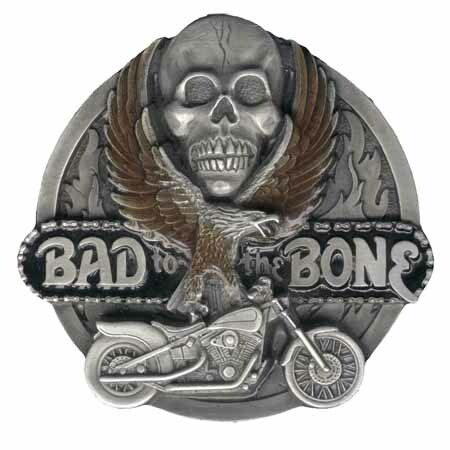 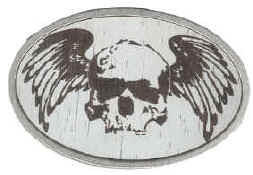 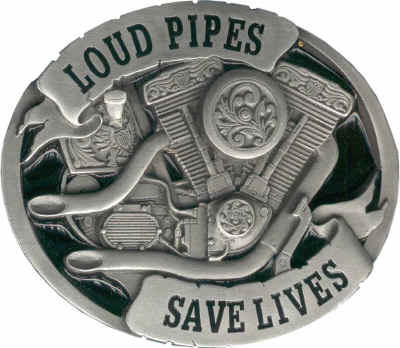 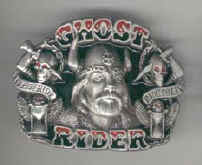 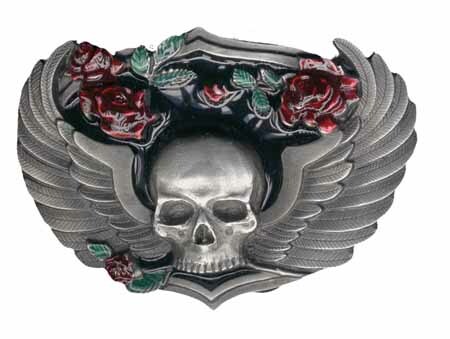 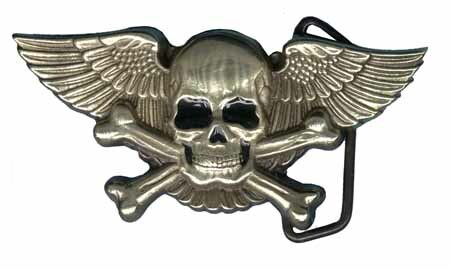 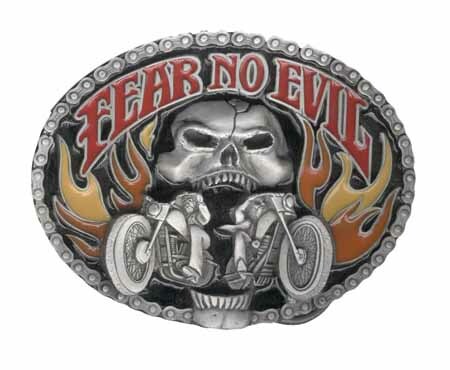 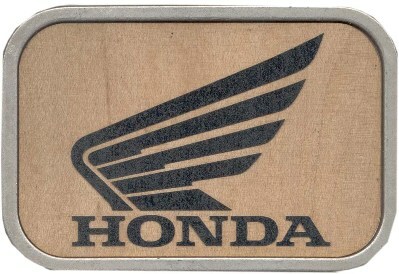 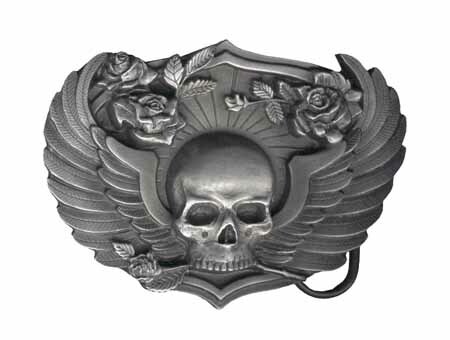 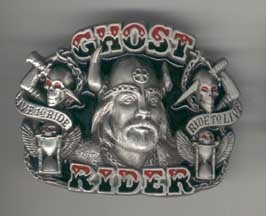 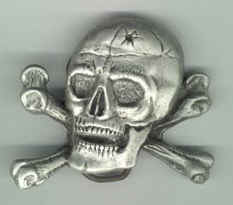 Great motorcycle buckles and biker buckles for those who really want to see where they're riding! 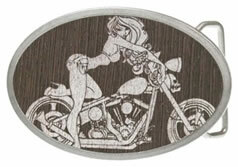 Also a Betty Boop Biker buckle, thrown in for fun. 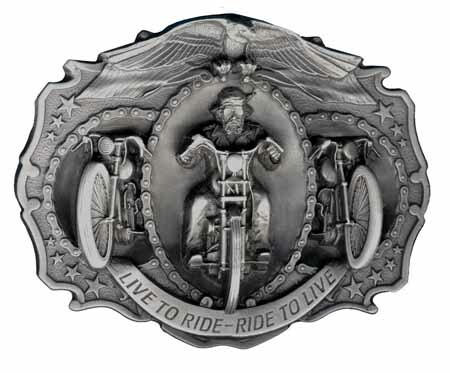 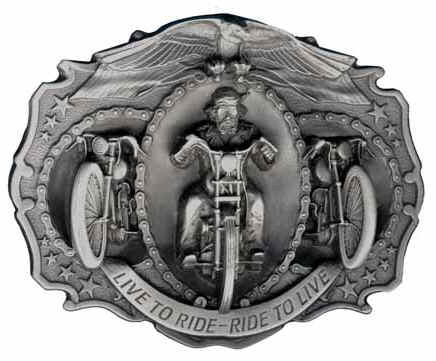 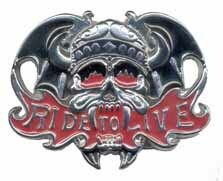 K180 - $26.99 Extra Large 5" x 4" buckle, "Live to Ride - Rider to Live". 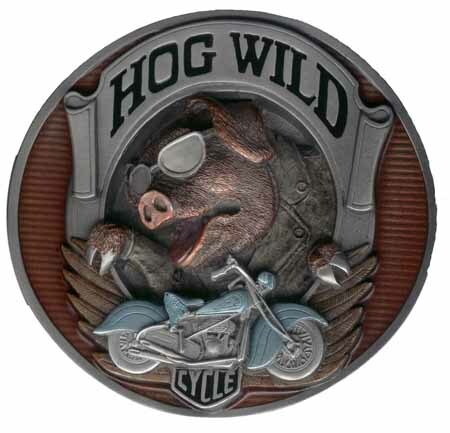 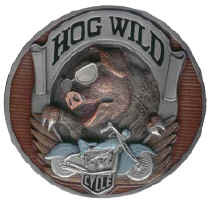 o180e $26.99 Large Hog Wild 4.5" x 4"
V45 - $14.99 3.5" x 2.5" buckle, "Live to Ride - Ride to Live". 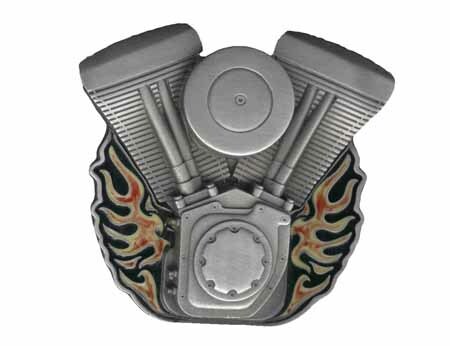 Buckle Sizes: Buckles are 3 1/4" wide by 2 1/2" tall -- give or take a quarter inch or so -- unless otherwise stated on the buckle page. 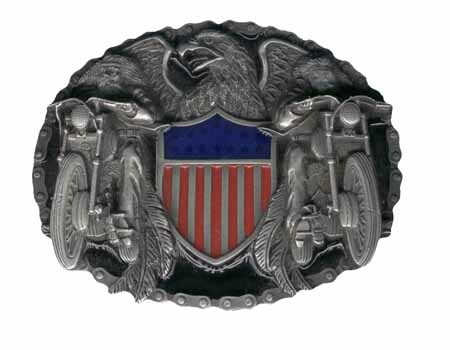 This is considered a good "average sized" buckle for either men or women. Visit our retail store in beautiful Estes Park, Colorado -- the Gateway to Rocky Mountain National Park. 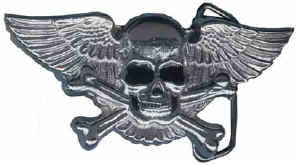 We are Buckles of Estes at 160 W. Elkhorn Ave., PO Box 4046, Estes Park, CO. 80517. 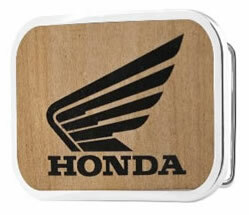 Did you bring a sports fan with you? Visit our 2nd store Sports Hound, for unique sports collectables. Located right next door to Buckles of Estes.